Last year, the Learning Escape Room was one of the most popular features of the Masie Center’s Learning 2016 conference. It was my first experience with an escape room and I was delighted to hear that it was coming back for Learning 2017. In 2016, a large group of conference attendees designed one escape room. They were broken into smaller teams, with each team designing one of the room’s puzzle chains. In 2017, there were two different escape rooms. Each room was designed by a different team of conference attendees who worked on the room as a whole. In 2016, there wasn’t a formalized leaderboard. 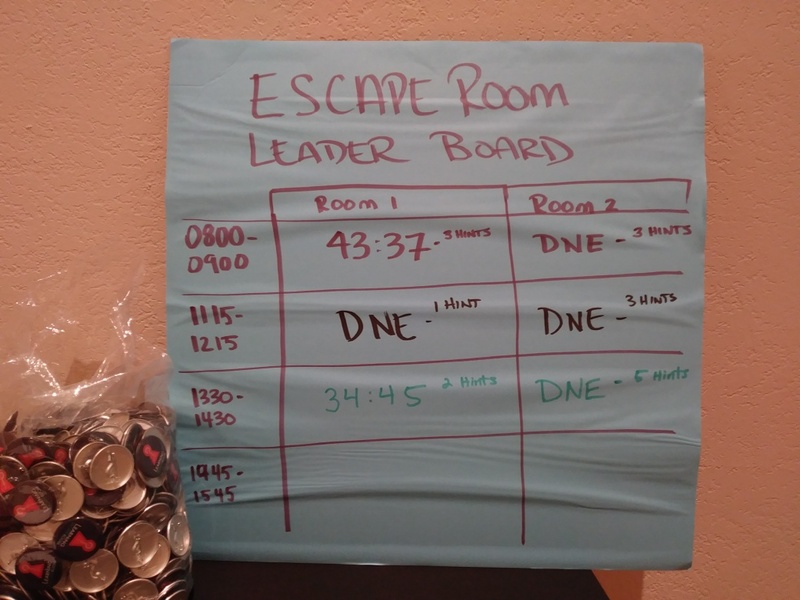 In 2017, there was a leaderboard posted outside each escape room. It listed whether each team of players escaped, how long it took them to escape, and how many hints they used. Team Building/Ice Breaker – Mainstream/commercial escape rooms are already used for team building and icebreaker exercises. And if that’s what you’re looking for, and cost isn’t a barrier, there’s no reason you can’t send learners to one of those escape room. That will save your organization the time, planning, space, and people required to make one from scratch. If cost is a barrier, you could certainly try making one yourself. But know that it can be an involved process. Alternative to Traditional Assessment – The escape room format isn’t naturally suited to teaching content. But it can be great for testing understanding, retention, and recall. In a case like this, you’d need to build your own so the puzzles will relate to the desired learning objectives and information. To make sure the learners are remembering long term, I recommend holding the escape room portion at least one day after the original training. Teach Design, Creativity, and Problem Solving – It’s natural to think about how you can build a suitable escape room for your learners. But remember, these escape rooms were built by other conference attendees, not by the coordinators. Why not use the design process itself as a separate training? Have one group of learners work together to craft the escape room as a design/creativity/ problem-solving training. You’d assign the theme to them and provide them with the materials from the training the other learners will be taking. That’s the information they’ll use to craft the room’s puzzles. Let’s say that your organization is rolling out some software training. It’s for a new customer service/help desk system. The learners are taking formal training and then being assessed using an escape room. There’s a customer compliant issue ticket onscreen in the system when the learners arrive. There’s a note attached to the issue ticket that gives the basic explanation that they need to escape by resolving the customer’s issue. The issue ticket number is actually the code for one of the combination locks. In the box opened by the combination lock, there’s a note “from your manager” about a specific returned item that they left somewhere in the room. The learners have to find that item in the room. There’s another note on the item that tells them that knowing the item number would be helpful. They use the system to find the item number, which opens another combination lock. In the box opened by that combination lock, there’s a pile of coupons. Sorting through the pile of coupons will reveal that some of them are valid, while the others are expired. And so on until they either escape or run out of time. Please note that the above example is made up off the top of my head. As such, it isn’t very instructionally sound. I didn’t have any learning objectives or real content to work with, after all. It’s strictly meant to be a description of the types of things that could be done. The key would be to make sure that the codes, actions, and clues tie into the content from the course. And you’re not restricted to combination locks and number codes. You could have physical keys, locks that use letters, and pretty much anything else you can dream up as long as it makes sense. Side note: If you really want to drive someone crazy, put one of the clues or code pieces inside an actual puzzle box and lock the instructions for the puzzle box inside a different box or part of the escape room. That was part of this year’s puzzle. Will we be seeing escape rooms join other “fun but truly functional” training exercises, like improv? We shall see. If you’d like to read more about training, learning, and instructional design check out the rest of this author’s blogs.